We are always looking for Hoo-rag Authorized Dealers. Do you have an awesome retail location that sells high quality products to anglers, fitness junkies, backpackers, motorcycle enthusiasts, hunters or other outdoor sports customers? If so, reach out and talk to us about becoming an authorized dealer. 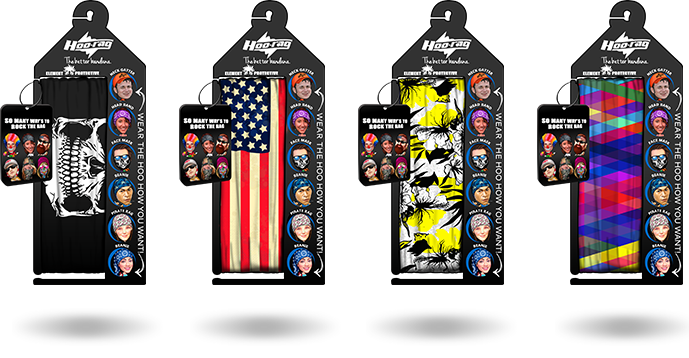 With over 200 designs and counting the Hoo-rag is your ultimate choice for tubular bandanas. We can help get you setup and rocking the Hoo-rag in your store with our awesome displays and clean packaging. READY TO BECOME A DEALER? Fill out our short application form below and we will get in touch. TELL US ABOUT YOUR STORE. Please enter as much information as you would like about your retail location. The more details you provide us about your location, customers, square footage, and more will help us determine if the Hoo-rag will sell well in your location and help us expedite your interest in becoming an authorized dealer.